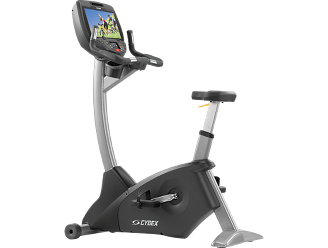 Cybex 625C Upright Exercise Bike is a magnificent exercise bike. This exercise bike helps user to reach its fitness goal faster and easier. Cybex 625C Upright Exercise Bike delivers fitness results faster for any environment and for any user. For those who have never ridden a bike before and those preparing for the Olympics, one bike does it all. Front wheels: Because bikes are more mobile than many other exercise machines, they don't stay in the same place all the time. The 625 cycles have wheels on the front for easy rolling so they can be moved around. Resistance Range:The 625C’s wide range of resistance (from 20 to 900 watts) can create a challenging or modest exercise experience. 20 Watts is much lower than most other bikes on the market and is important for de-conditioned users. 900 watts “can make a grown man cry” – quote from a veteran cyclist. Single Stage Drive: The self-tensioning single-stage drive and hybrid eddy-current self-generating brake provides high torque capabilities with exceptionally low drag to provide an exceptionally broad resistance range of 20 to 900 watts with superbly smooth operation.